Information and activities that focus on the Anzac story and commemoration. More information. - Audacity: heroic Australians (60 pages). Studies Magazine Issue 1 2008. For Gallipoli questions see pages 16-18. Information and cutouts for students to use in completing My Storybook (next item). For completion by students, using the worksheets of the previous item. Information for completing the rest of the previous item. Stories about love and friendship during wartime. Mainly primary. A Forever Yours docx version is available. For more information see the DVA Education Resources: Forever Yours page. Information and learning activities on love and friendship experienced during times of conflict. Mainly secondary. For more information see the DVA Education Resources: We'll Meet Again page. Many activities refer to the use of a CD/DVD but teachers will be able to adapt many questions for use without that resource. A CD/DVD is refered to but teachers weill be able to make good use of this booklet of activities. Scroll down for the individual pdf files to download. Designed for use in conjunction with Memorial Box 03. "The Anzac Story from the Interpretative Panels at the Anzac Commemorative Site at North Beach, Gallipoli Peninsula." Scroll to the bottom of the page for links to pdf files. 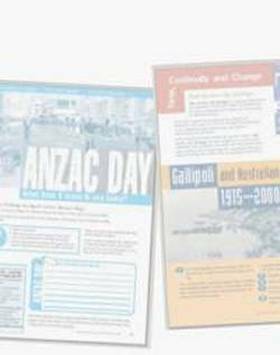 "Educational materials to support the commemoration of ANZAC Day." "Students can learn about the experiences of Australians on the Western Front between April 1916 and November 1918 through images, film and classroom activities. Published 2006." The booklet was producdd in conjunction with a CD-ROM, but teachers may find much of the material useful without reference to the CD-ROM. More informationhttp://anzacportal.dva.gov.au/resources/australians-western-front. By Matt Walsh. "This booklet is an initiative of the Defence Reserves Association (NSW) Inc. and the Military Police Association of Australia Inc. as part of their Schools Military History Program." No longer on the DVA website, presumably because it is a little out of date. Traces the participation of Australia's armed services in war and peace. This Year 2 unit focusing on the local war memorial is mapped to the Australian Curriculum and includes use of the books as well as other activities. Note the two pdf files to download. (A liftout rather than a booklet). Covers: Gallipoli landing, evacuation, naval perspective, diary entries, submarine AE2, air power, Turkish perspective,VCs, Anzac nurses. List of downloadable publications (already listed separately above). The worksheet questions would appear to be designed for students in Years 7 and 8. Anzac Day posters, worksheets, task cards, word search. Requires registration and payment. See also the Pinterest page for this resource.